A common base class for GUI controls. 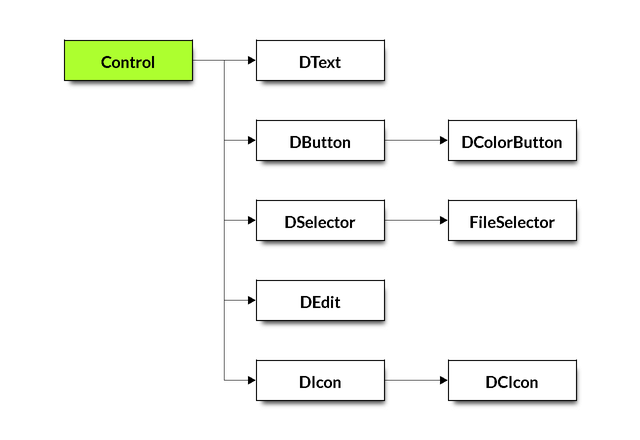 Subclasses: DText, DButton, DSelector, DEdit, DIcon, _DItem. Returns TRUE if the x and y of the event lie inside the control. Highlights the control if the mouse is over it. theType (number) – ctlBUTTON, ctlTEXT, ctlEDIT, ctlICON or ctlSELETOR. TRUE if this control is of the type specified. stateFlags (number) – Any combination of csENABLED, csEXIT, csFILTER or csSELECTED. A non-zero value if the control has this state.